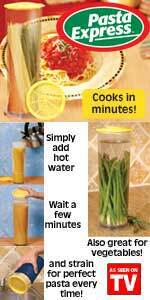 No more broken pasta or trouble straining water. The Pasta Express will cook up to 1 lb of pasta in minutes, right before your eyes. Once the pasta is cooked, remove the Thermo cook top and the straining top allows you to easily drain the water with no mess or spilling problem. Also great for vegetables and shrimp.